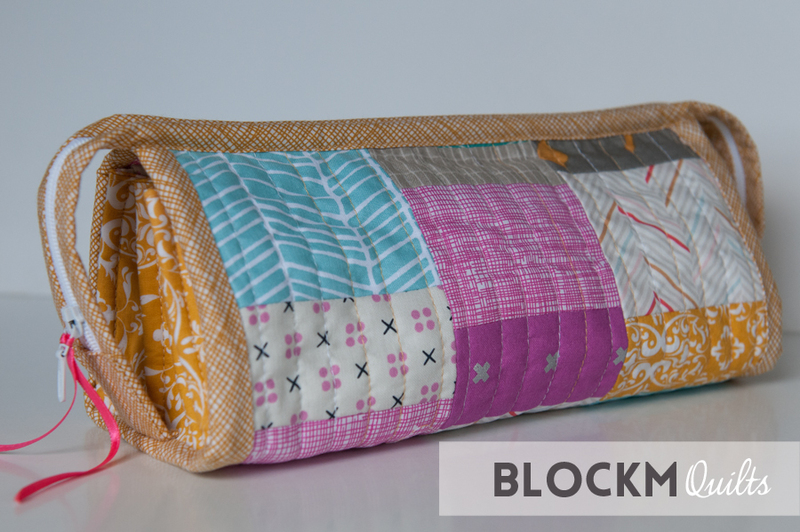 block M quilts: I made a Sew Together Bag! I made a Sew Together Bag! 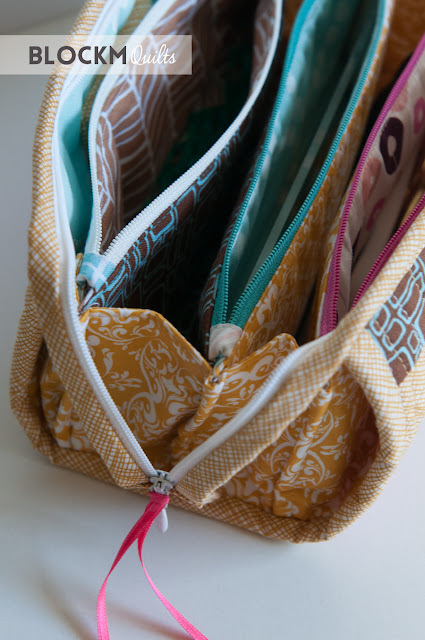 I have always admired the Sew Together Bag but never attempted it as it looked... complicated. But since I have set up my sewing corner in our living room while still cutting fabric on our kitchen table I have sewing tools in two places. That really started to annoy me so I decided to make a Sew Together Bag to keep all my stuff together. This bag is just genius! I have my very regular sewing tools in the open pockets so when I open the main bag they are readily available. My seam ripper is in the pink cross hatch pocket not visible. I also opted for a little pin cushion at the outer pocket. I had so many left overs from my 'Playground Quilt' that I used these and bought zippers to match. In fairness the bag is not easy to sew. 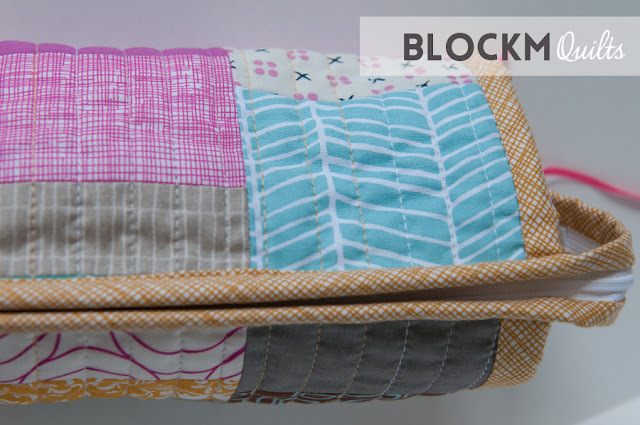 And if it wouldn't be for Heather's Sew Along at QuiltBarn I would have never been able to make the bag. So thank you, Heather, for the very detailed blog posts with lots of photos!!! 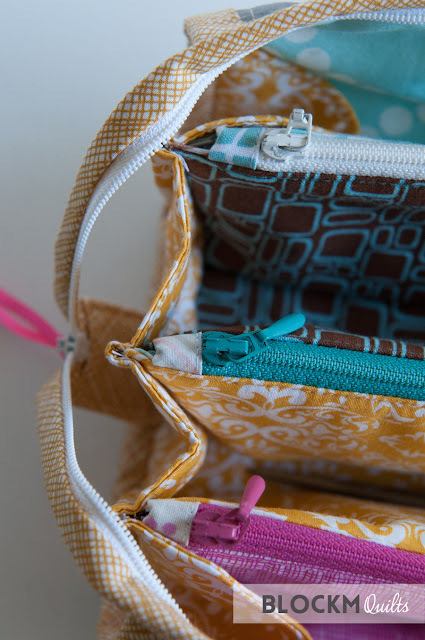 I was looking at a lot of Sew Together Bags online for inspiration and found this blog post by Amanda of Crazy Mom Quilts and opted for little fabric pieces at the end of each zipper. Not only does it add a little more colour it also is easy to sew. Since this is my first bag and I have not tried it without these fabric pieces but I would always do it again that way. I quilted the outside panel of the bag in straight lines using three different Aurifil wt40 threads. 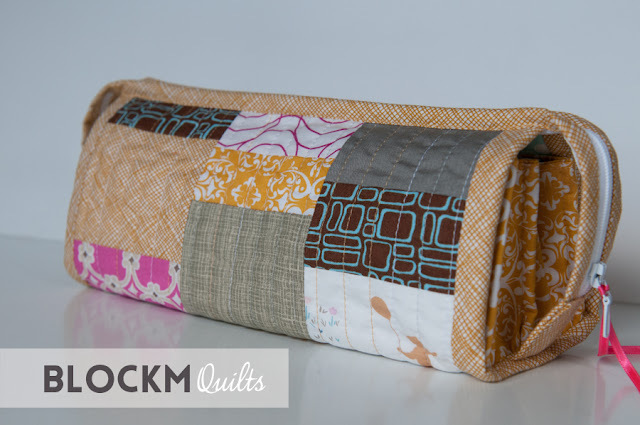 This was actually the first time I quilted with my new Juki and I loved it!! I also like that the bag looks so different at each side. Inside the zipper pockets I have the less needed tools such as wonder clips, hera marker, measuring tape and small ruler, additional scissors and a finger hat. I am currently making another bag as a present for my friends since I have a lot more scrappy strips left over to use for the outside of the bag. 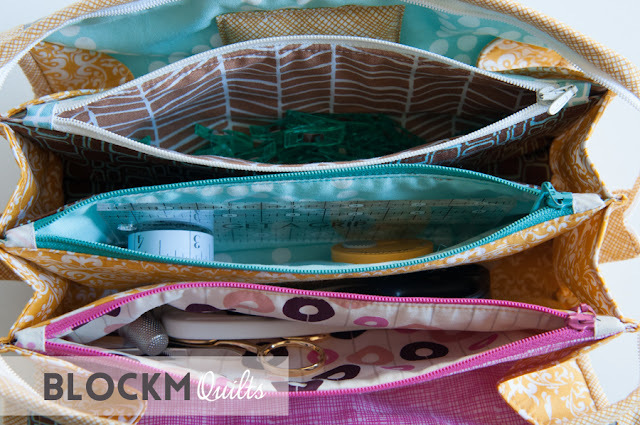 I'm using the same fabrics again for the second bag apart from the pink fabric to the right in the photo. I realised that one open pocket in my bag is all in one colour (the mustard/white print) and to add a bit more variety I'm going with pink from the inside. For the binding I used one of my favourite fabrics: Carolyn Friedlander's cross hatch in mustard. I have also attached a little pink ribbon to the outer zipper, that is a little bit easier to open and looks good. This will not be my last Sew Together Bag, I need at least two more in my house for various items to store. Also, this makes a great present! The pattern can be found here and is by Michelle of SewDemented. Yours turned out beautifully! 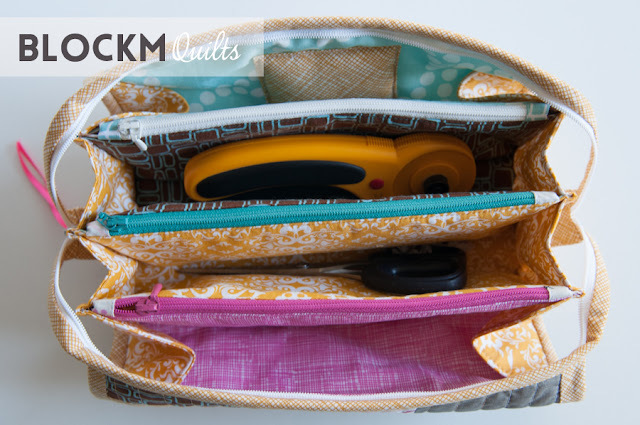 I'm still a little scared of it, but it's a fun pouch idea for sure! I totally agree. Once you have one, you want another :) I received my first one in a swap and had planned to make another for ages. I finally started some weeks ago but finished "only" one of the three... anyway... 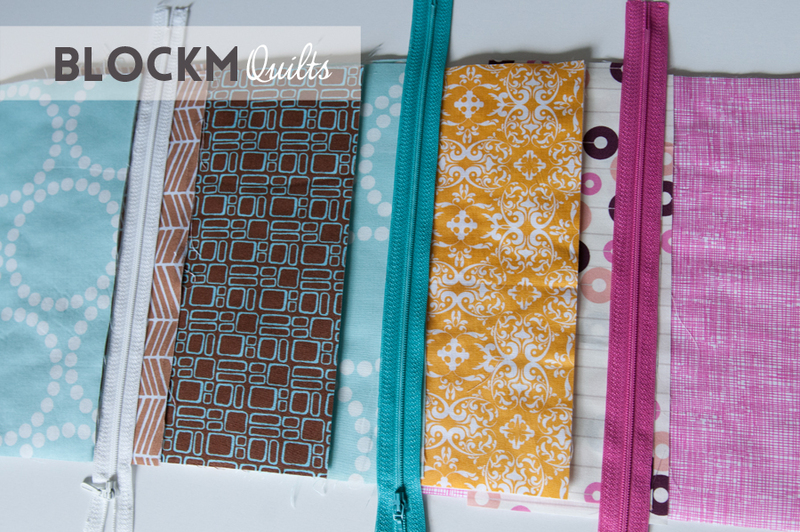 They are not simple but easy enough to finish with the pattern plus tutorial. 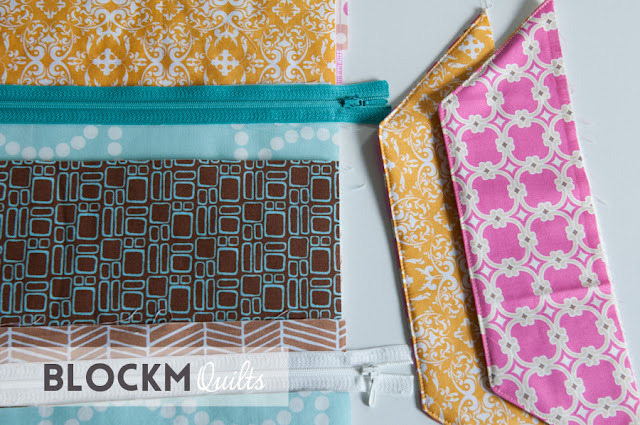 Isn't it fun to play with so many fabric options? I think yours fits you well. Enjoy it! Your bag is fabulous! So too, is this post. I really appreciate the helpful links and tips as well as the tour through your bag. Thanks so much for sharing your experience and the terrific outcome! Wow great little bag. I keep thinking I should try one.